This sandwich has a little bit of everything. 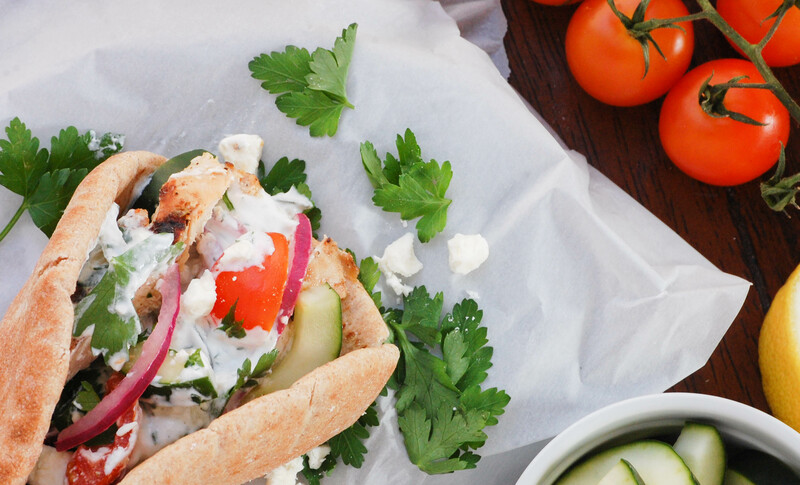 Juicy grilled chicken, fresh cucumber, tomatoes, onion, and a generous heap of feta, all wrapped up in a pita. 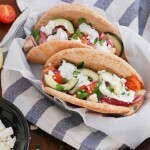 These Greek chicken pitas are simple and customizable. The only part that you have to cook is the chicken; the rest are add-on ingredients. Well, okay, you could really stretch your cooking abilities and warm up the pita too. At our house we have sandwiches for lunch a lot, usually turkey or tuna. To switch things up a bit I decided to try making chicken pitas. I’d made them once before with my mom and sister and the recipe was a hit. The pita pockets would be great for dinner as well—perfect for picky eaters, or for having a group of friends over. You can set out all of the ingredients on the table and have each person make their own version, based on what they like. The key to delicious chicken in this recipe is to let it marinate for awhile. I used a Greek-style marinade that typically goes with chicken kabobs or gyros. 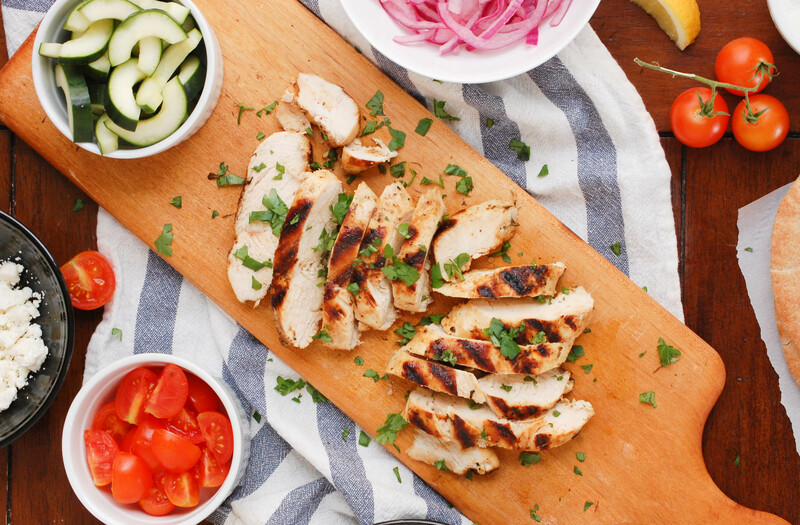 The yogurt helps the chicken to stay moist, and the lemon and oregano provide a ton of flavor. As far as the other ingredients go, they can be adjusted depending on what you want to go into your pita. The recipe amounts are just a guideline. Or you can use substitutions, because I know for example that some people don’t like raw tomatoes—so try some roasted red peppers instead. 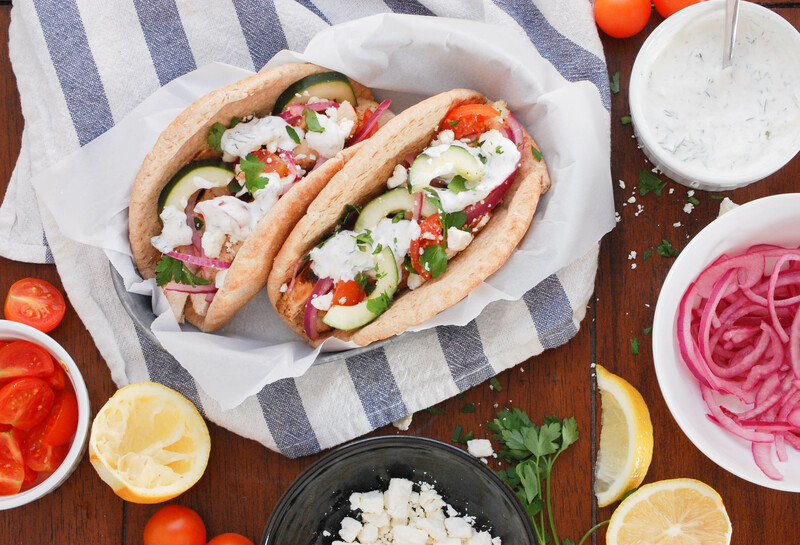 For my pitas, I used store-bought tzatziki sauce (gasp) because, well, we found a brand we like. If you want to mix up your own tzatziki, it’s an easy blend of Greek yogurt, cucumber, garlic, dill, and olive oil. Slather it on. I also bought the pitas instead of making them myself (as a good food-blogger would, oops). Breaking all the rules. But who has time for all that?! Once the basic ingredients are chopped and sliced, you have a meal that is easy to assemble at any time. I recommend enjoying the chicken pitas with a side of french fries or couscous. A completely satisfying and delicious meal. Place all of the marinade ingredients in a gallon-size Ziploc bag and shake well to mix. Add the chicken to the bag and toss to coat the chicken. Marinate for at least 1 hour, or up to 4 hours. Brush the grill or a grill pan with oil, and preheat to medium-high. Remove the chicken from the marinade and place on the grill. Cook for 6-7 minutes on each side until the chicken is cooked through. Remove from heat and let rest for 5 minutes. Slice into strips. Assemble the pitas. 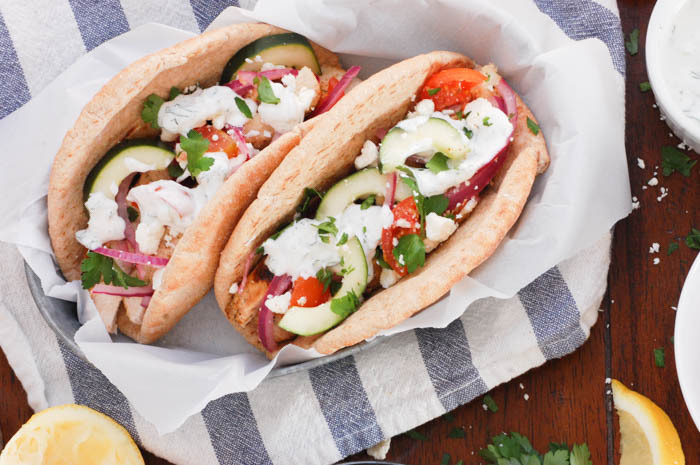 Place a couple pieces of chicken onto a pita, followed by tomato, cucumber, onion, feta, and parsley. Drizzle with tzatziki and enjoy. This can serve 2-4 people, depending on appetite.